To the veteran frequent flyer, 100,000 miles may seem like nothing. If you know how to maximize them, though, 100,000 United miles can get you far. You might be surprised to learn how quickly you can go from 0 to 100,000 United miles, and to see just how much value that six-figure balance can get you. Today, I’ll continue on from American and Delta to show you how to earn and maximize 100,000 United MileagePlus miles. Unsurprisingly, credit card bonuses continue to lead the way when it comes to accruing significant amounts of frequent flyer miles. Accruing United miles is particularly easy thanks to the ability to transfer Chase Ultimate Rewards points to United at a 1:1 ratio. Even better, transfers are usually instantaneous, and they aren’t subject to an excise tax, which is unfortunately the case with American Express Membership Rewards. Perhaps the most undersold perk of the card is access to additional award space that’s not available to non-cardholders. This is why I keep the card in my wallet. There are occasionally targeted offers for a 50,000-mile sign-up bonus (sometimes available once you log in to your MileagePlus account). The $95 annual fee is waived for the first year. I’ve seen sign-up bonuses as high as 60,000 miles for this card in the past. The $95 annual fee is waived for the first year. The information for the United MileagePlus Explorer Business Card has been collected independently by ThePointsGuy. The card details on this page have not been reviewed or provided by the card issuer. For more information on this card, read Nick Ewen’s post on why it should be the first card you add to your wallet. MileagePlus Dining is one of several alternative ways to easily boost your account balance. MileagePlus X — The app makes it easy to score significant bonus points on everyday purchases. MileagePlus Dining — Add the credit cards you use at restaurants to this program and start earning bonus miles at participating restaurants. Just two of the above credit card sign-up bonuses can put you at or above 100,000 miles. Once you become strategic about your credit card spending, you’ll reach 100,000 miles in no time. Before trying to squeeze every ounce of value from your miles, make sure you understand the basics of booking award tickets with United. Flights that are 700 miles or less in length and serviced by United or United Express will cost 10,000 miles one-way or 20,000 miles round-trip at the Saver level. This a 20% discount on the usual 25,000-mile cost of a round-trip domestic economy Saver ticket. I find this especially useful when I need a last-minute flight and can avoid the ridiculous $75 close-in ticketing fee. A $253 short-haul flight from Newark to Charleston costs just 10,000 miles. This can get complex, so hang in there. United’s award chart is zone-based, and the United.com award-booking engine cannot always handle the pricing of an award when multiple zones are involved in an itinerary. This results in itineraries actually becoming cheaper by adding more destinations and additional flights. The common example is the Oceania region (note that United defines this term differently) “overpowering” many other zones in the itinerary, so your award will price out at the rate for flights to Australia and New Zealand. Add in United’s surprisingly generous award-routing rules (allowing a stopover and two open jaws on round-trip international tickets) and you can really begin to make some big itineraries for a small number of miles. If you’ve been watching the blog in the last few months, you’ve seen all kinds of cheap fares to Tokyo from across the US. In honor of these fares I’ll start a trip from Tokyo. 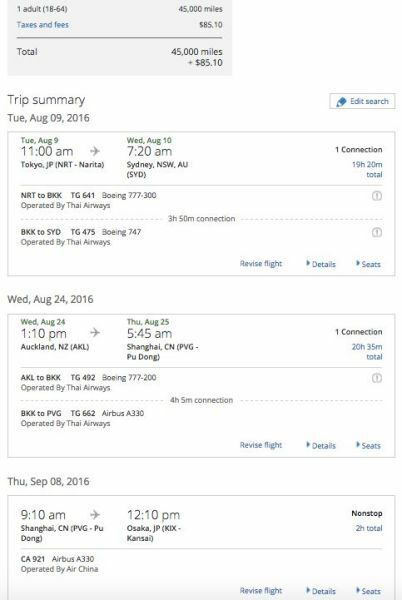 I call this ticket the AO (Asia/Oceania) express: NRT-BKK-SYD (open jaw) AKL-PVG (stopover)-KIX (open jaw) for 45,000 miles. By adding a 24-hour stopover in Bangkok, you can visit five Asian/Oceania countries for 45k miles. This allows you to start in Tokyo and spend close to 24 hours on a layover in Bangkok; visit Sydney, Auckland, Shanghai and Osaka for 45,000 miles. You’ll be responsible to find a SYD-AKL flight (10,000 Avios on Oneworld partner LAN) and a KIX-NRT trip, which I personally would use to visit Kyoto and take a bullet train back to Tokyo. The best part? 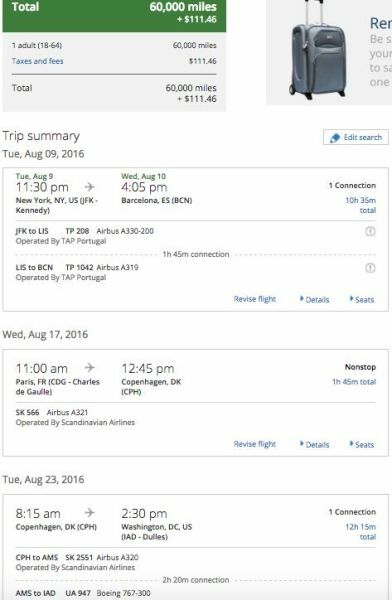 This leaves you 55,000 miles — just shy of enough for a round-trip US-Europe economy ticket where you can again exploit the award-routing rules to visit four European countries and come back to see a second city in the US: JFK-LIS (stopover) LIS-BCN (open jaw) CDG-CPH (destination) CPH-AMS (possible extended layover to visit Holland) AMS-IAD (open jaw). Take advantage of United’s stopovers and open jaws to maximize your trips. On the European leg of your trip, you would be responsible for transportation from Barcelona to Paris and D.C. back to NYC. You can do these cheaply via low-cost carriers, trains or bus. You probably noticed you would need 105,000 miles for these two trips, but surely obtaining the 5,000 extra miles is worth it to visit nine countries. Plus, it shouldn’t be too difficult to earn those extra miles if you’re maximizing your credit card spending. Finally, note that the combinations of countries and cities you can mix to create itineraries like the above examples are virtually endless. So have fun creating your two itineraries of a lifetime! United miles open up the possibility of flying some of the best business and first-class products in the sky. So much so, in fact, that United started charging more for Star Alliance partner premium-class redemptions on international flights when compared to its own product. Thai Airways A380 Royal First cabin makes for a fantastic ride. ANA, Asiana, Lufthansa, Thai and Turkish business class all come to mind. 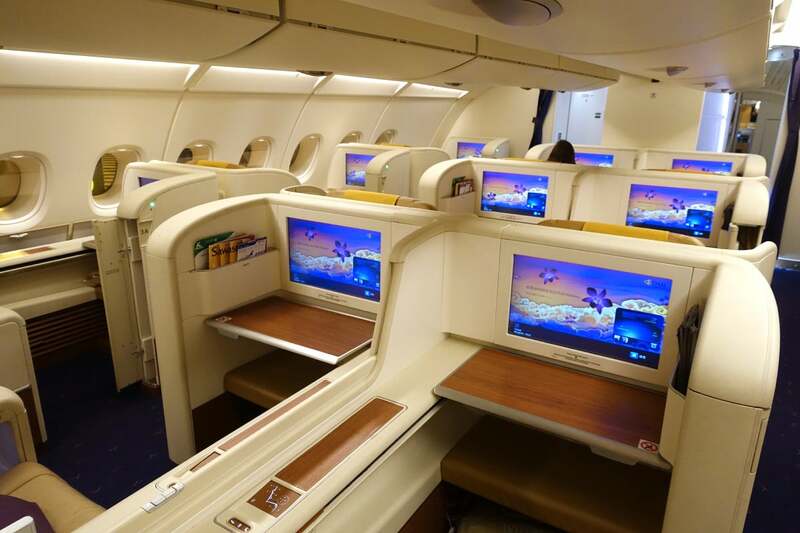 Fly Thai Airways A380 business class seven hours for 40,000 miles from Tokyo to Bangkok. Fly 14 hours in Asiana’s A380 business class for 80,000 miles from JFK-ICN. The one downfall here is you cannot book Singapore First Suites with United miles. For 100,000 miles, you can book a round-trip Caribbean vacation to three destinations, fly another ticket round-trip to Hawaii and still have enough miles for a short-haul domestic round-trip ticket. Use Copa airlines to create your own unique Caribbean itinerary for only 35,000 miles. This leaves you 65,000 miles — enough for a 45,000-mile US to Hawaii round-trip and 20,000 miles for two domestic short-haul flights. Don’t forget to utilize the same open jaw and stopover rules for your US-Hawaii round-trip to maximize the 45,000 miles for that ticket. Don’t believe the color-coded award calendar on United.com; you might find availability that it doesn’t display. Availability results change when searching multi-city itineraries. Stick with searching leg by leg until it’s time to piece the whole ticket together. If you call in to book a complex itinerary, you may have to speak with multiple phone agents until you get one who understands the complex routing rules. 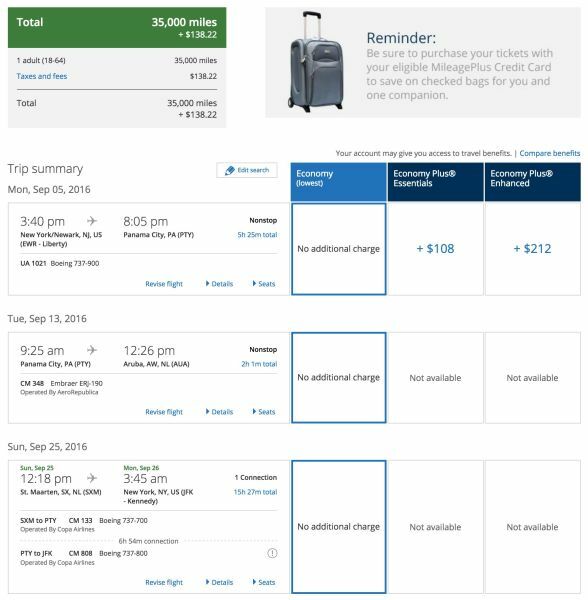 Do your best to avoid United’s award-booking fees, which include close-in ticketing fees (booking within 21 days of departure) and a phone booking fee (which should be waived by an agent for itineraries not bookable on United.com). If you have United elite status, you’ll enjoy reduced or waived fees as well. How would you maximize 100,000 United miles?